Is this the first solid evidence to the fate of MH370 — or another dead end? Now, however, the discovery of what appears to be part of an aircraft wing – the flaperon, to be precise – has raised new hopes, over 16 months after MH370 went missing. Australian Deputy Prime Minister Warren Truss called the discovery a “major lead” and a “very important development.” China’s Foreign Ministry issued a statement saying it “will follow [developments] closely.” There were 152 Chinese citizens on board the plane, the most from any country. The debris will be shipped from Reunion to Toulouse, where the BEA (the French authority responsible for investigations into civil aviation incidents or accidents) will attempt to verify the origin of the wreckage. According to Razak, Malaysia is sending a team of experts to Toulouse, as well as sending a team to Reunion to examine where the debris was discovered. If the debris is indeed identified as part of a Boeing 777, that raises the likelihood that it’s tied to MH370—that is the only such aircraft that is unaccounted for, according to the Aviation Safety Network. A local Reunion paper published a photo purportedly of the debris where the serial number 657BB is clearly readable. That serial number corresponds to a Boeing 777 serial number for the flaperon, which is mounted on the rearward edge of the wing and raised or lowered to control an aircraft’s bank. (The photograph, however, could not be independently verified, and some have questioned its authenticity). Even if the wreckage is verified to come from the missing plane, it doesn’t mean the search is close to an end. 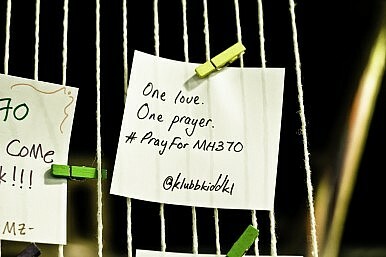 Dr. David Ferreira, an oceanographer at the University of Reading, said the wreckage would not be very helpful in pinning down the final resting place of MH370. “Put bluntly, over a 16 months period, the debris could have traveled from nearly anywhere in the Indian Ocean to Reunion,” he told The Guardian in an email. Still, he explained, the debris could help narrow the potential search area if combined with other evidence. Malaysia's prime minister says the wing fragment has been "conclusively confirmed" to be from MH370. Asia’s New Way to Find Missing Planes After MH370?Flight MH370 Shows Limits of ASEAN’s Maritime CooperationMalaysia Airlines Flight 370 Search and Rescue: Cooperation in the South China SeaIndia, US Conduct Anti-Submarine Warfare Drill in Indian OceanWith Hanoi in the Rearview, Will Kim Jong Un Turn to Russia?